We’ve been given this set as a gift, twice. So that must mean something. And I’ve noticed these pieces in many a drawer and dishwasher. Which brings me to my first point about this start cutlery set by Rada: Don’t put in the dishwasher! The steel for the blades are wonderfully super sharp, hold an edge, and quite flexible. But the silver brushed handles are made of aluminum (which makes a nice non-slip grip) and that aluminum will tarnish and pit if you put it in the dishwasher. 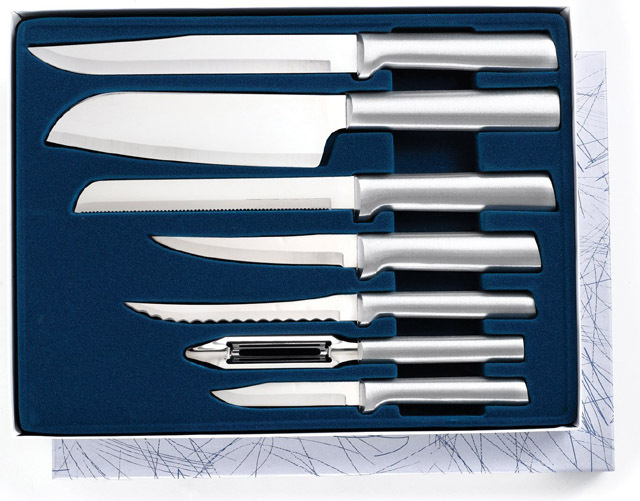 The set contains a regular paring knife, vegetable peeler, tomato slicer, long parer, 6″ bread knife, cook’s knife, and a slicer. It does make a great gift for the student or someone who never has a decent knife in the house when you visit. I’ll admit to living off of Ichiban cup-o-noodles (or the brick-o-noodles) in college. I have to further admit that it is still my go-to meal at work when I’ve forgotten lunch, am too lazy to go out, or just don’t have any time for anything more. 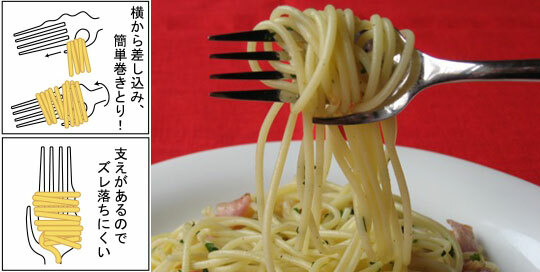 The Calamente Fork that I first read about over at my fave site BoingBoing is a Japanese product that is made for picking up noodles (ramen or spaghetti) and twirling effectively. The design on this piece of cutlery is elegant and more of a single use tool and conversation piece than anything. But clever none the less. The Electric Knife is one of the few “automated” pieces of cutlery in the kitchen that makes sense. The electric fork for twirling spaghetti is a comedic disaster. A nice thing about the Electric Knife is that it is a kitchen multi-tasker. It can be used for carving the Thanksgiving Day turkey, slicing home-made bread, filleting fish, and even cutting foam for new cushions. 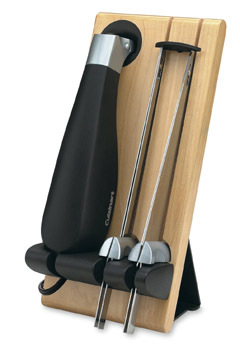 This model CEK-40 from Cuisinart has stainless steel blades (one for bread and one for carving) and has an nice wooden stand for storage. It’s powered by a plug-in-the-wall 120 Volt motor so that means more power and no fussing with charging batteries (stay away from wireless when buying something like this). Ergonomic design with safety switch and it works for left or right handers (I’m a lefty and am grateful). It’s a great deal and that first morning you use it to slice a bagel you see why it’s handy. I’m certain you’ve noticed in a recent visit to any department store that Christmas is looming. Seems we are being trained to start preparing the minute after Halloween. I’ll admit that we don’t decorate in November but we certainly start to plan and collect what we’ll need for the holiday season. These cute little cutlery holders for your silverware are perfect for the Christmas dining room table. 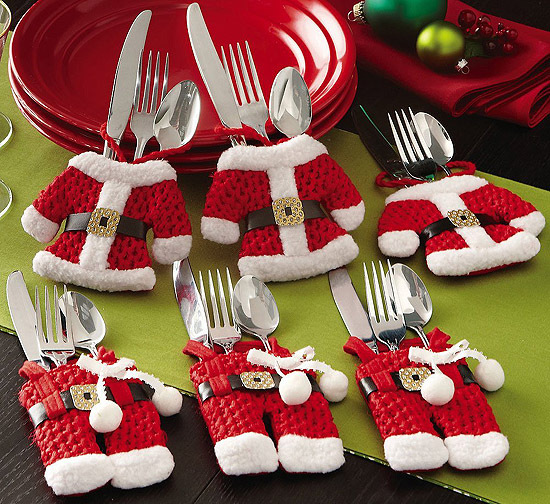 Each Santa themed pocket will hold a fork, knife and spoon. They come in a set of 6 that include 3 pair of pants and 3 jackets. They are made of polyester so they will hold up pretty good but I wouldn’t recommend machine washing them. Our plan is the pants for the boys and the coats for the girls to indicate seating arrangements. And they are not just for the kid’s table! (When will I finally get to sit at the adult’s table? ).